/ What’s Needed On A Wedding Checklist? What’s Needed On A Wedding Checklist? Making arrangements for a big or small wedding requires quite a bit of preparation before the day of the event. Since wedding budgets can vary greatly from one wedding to another, the bride and groom should know the financial allotments that they will be working with. This is prior to heading off to the bridal store. Therefore, in order to make sure that everything for the wedding is covered properly, one of the best things that each couple or their wedding planner should always do is create a wedding checklist. A wedding checklist is needed for many different reasons. That includes ensuring every detail of the wedding is taking care of well in advance. Weddings can be very costly, the expenses can be controlled much better when the money can be allocated to specific items needed for the wedding. 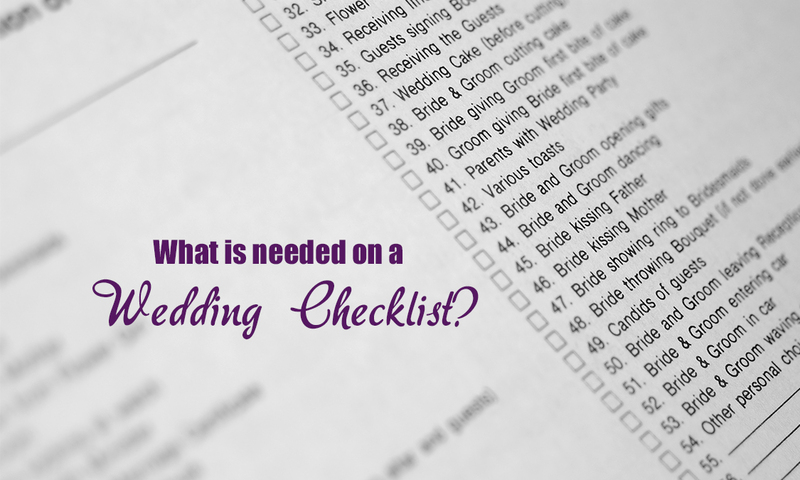 Having said that, what exactly is needed on a wedding checklist? The budget amount allotted by the couple can make a significant difference in what will be paid out before or on the day of this event. In fact, many couples start out early with their planning by ensuring everyone has what they need for the appropriate attire. From making sure the bride chooses “the” wedding dress to selecting the right type of suits for the men in the wedding party. There is a lot that has to be accomplished before everyone is prepared to march down the aisle. All of which and more are common things that should be documented on the wedding checklist. Getting ready for a wedding can be very taxing and expensive too. Therefore, to make sure everything is carried out smoothly without any unnecessary disruptions, one of the FIRST things that are needed is a wedding checklist. This checklist is used for both planning and completing all of the necessary activities that need to be done before the wedding day.